1. Stop your MySQL server completely. 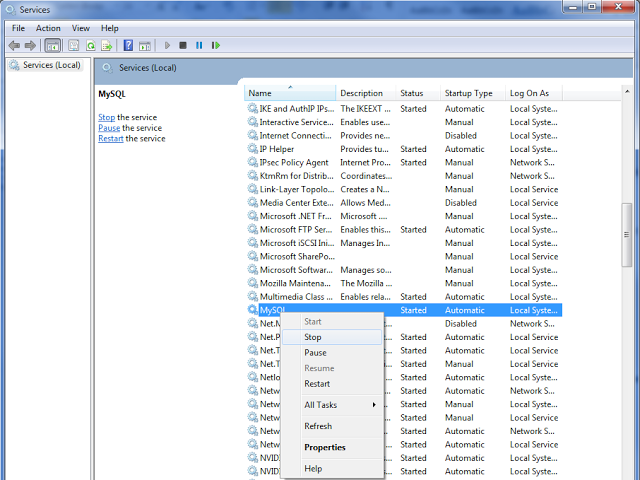 If it is running as a service, You can run the following commmand in cmd to stop sql service. If it is not running as a service use the windows taskmanager to stop the server. C:\> cd "C:\Program Files\MySQL\MySQL Server 5.0\bin"
5. Enter the mysql command in the cmd. affiliates. Other names may be trademarks of their respective owners. 6. Now this time you will be directly login to mysql root user without password. Now execute the following commands in mysql prompt to reset the mysql root password. 7. Then close the first command prompt and type "exit;" in the second command prompt to exim from mysql prompt. You can now start the MySQL service.